It’s hard to write a review about a film that’s so much-loved and regarded by pretty much everyone as a modern classic, without sounding too obvious or even without upsetting somebody out there. So for the time being I might just start to talk about the first 5 minutes of this undisputed classic. More than a review, this is really just an excuse to talk about one of my favourite films. And what better excuse to do that if not its new release on Blu-Ray for its 25th anniversary? So, inspire by the recent BBC “Film 2010” item, I am going to re-visit “Back to the Future” to try to understand what makes those films such undisputed classics. Right from the very beginning of this film, in fact from the very first shot, you can tell that we are in the hands of somebody who knows exactly what film-making is: somebody who knows that film-making is about telling a story with pictures. And that’s exactly what “Back to the Future” does. The very first shot of the film is a clear example of certain type of story-telling that we are going to find throughout the whole film: a single tracking shot, moving through all the various clocks and inventions in the room, will not only tell us everything we need to know about Doc Emmet Brown but also will set up lots of clues and issues which will later become pivotal moments in the story. But I’ll get into that a bit later. We can tell straight away that this is going to be a film about “time” as the camera travels through all the various clocks in the room. We can tell that the person who works or lives here is must be a rather eccentric person, maybe an inventor or some sort of scientists. The pictures on the walls, the framed newspaper articles, the mad inventions. No need for dialogue: pictures tell a thousand words. I love the subtlety of the details hinting at the various plot points that we’ll later find out in the film. This is so typical of Back to the future. it is something that permeates the whole film, right from the start. Watching this particular shot (well, in fact, the whole film) is even more enjoyable the second time around (…or third, or fourth… Or like me, the erm… not quite sure actually: I’ve lost the count a long time ago). And so we hear the TV announcer talking about the missing plutonium, the clock with the little man hanging from one of the hands, the box of the plutonium itself at the end of this first very long track). Even technically, the whole camera set-up is pretty impressive. Zemeckis is the master of these kind of one-take wonders and he’ll get them to perfection in later films such as “Contact” (with shots that go through windows or, like a particularly amazing one, through a mirror), but also “The Polar Express” and “Beowolf” where he was able to use the animation and create camera movements which would have been impossible on a real film. 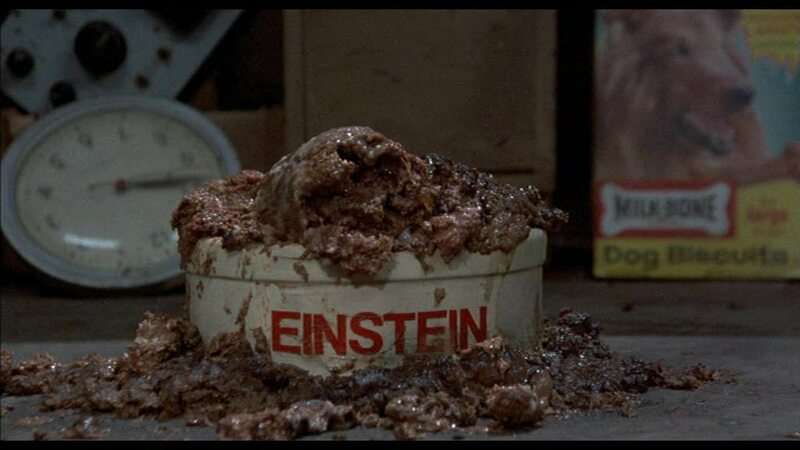 As the film geek that I am, I’m always a bit annoyed by the cutaway of the dog’s food landing on Einstein’s bowl. Even though it works absolutely fine, it breaks the flow of that otherwise-perfect single take and it’s a shame. I’m sure they could have found another way to show us the bowl somewhere around the time when Marty comes in, keeping the one-take tracking shot unbroken. Anyway, moving on, Michael J Fox, enters the scene. After the long first tracking shot, the pace gets a little bit faster in a succession of quick tight shots, as Marty plugs himself into the amplifier. Marty flies into the air, crashes into some shelves and finally reveals himself to the audience, as he takes off his ridiculously 80s glasses. What an entrance! I still remember watching this in a packed theatre and hearing the laughter from the audience at this point. 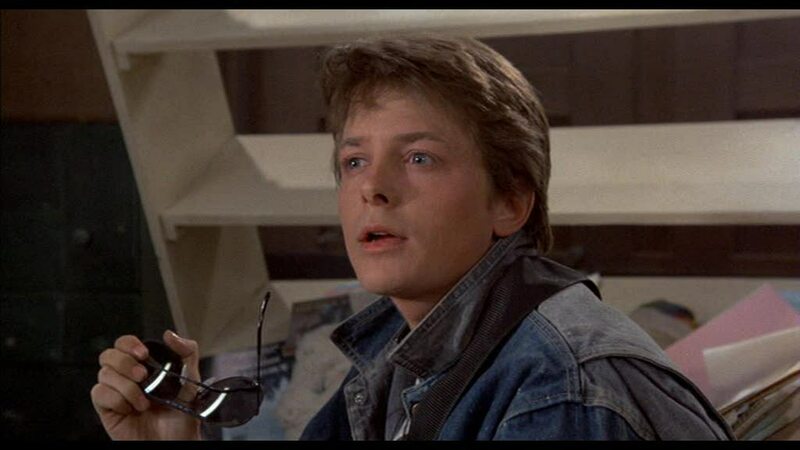 The films really grabs you right from the start and it’s mainly because of Michael J Fox’s charm and his ability to be likeable (I can see why they decided to dump Eric Stoltz). And because of the deliberately slow first 20 minutes of the film, it is essential to have somebody like him as our main character. And we like him straight away. “Damn! I’m late for school!”. How can you not like him? What this first shot manages to do is pretty much what the whole film does all the way through. It plants the seeds for things that will get resolved or explained later on, setting you up for a big payoff or simply just joke. I mean… I could probably go on forever! In a way, the whole damn script is quotable today (In the BBC Film 2010 video above, they do a nice little montage of some of the famous one liners”). I hear that the script is used all over America in lectures on how to write the perfect script. Whether it’s true or not, it makes perfect sense. I’ll finish off the little “review” of the first 5 minutes of the film by mentioning the song that kicks in once Marty jumps on his skate :”The Power of Love” by Huey Lewis and the News. Watching it then, at the time, back in 1985 when the Back to the Future was released, this song gave you just the right amount of energy that the film needed at this point, to lead you to the next few scenes. Watching it today, it’s like a blast from the 80s, in the best sense of the terms. Nowadays it’s impossible not to associate this song with the film, but also, it’s impossible not to think about the film thinking about or even humming this song. And just like the chicken and egg never-ending question, it’s impossible to think of one without the other. There’s obviously a lot more to talk about in this film (and its sequels too): not just the fabulous Christopher Lloyd and the rest of the great cast from Crispin Glover, to Lea Thompson, to Thomas F Wilson, but also the amazing action scenes, the witty humor, the sharp editing, the make up and special effects, the twists, the skate boards… and of course “johnny B Good”. But for now, let’s just leave it to that. If there’s enough interest I might carry on examining the rest of the 3 films.